The BOSS OD-1X Overdrive and DS-1X Distortion pedals are highly regarded by players everywhere for their incredibly natural sound, great response, and wide tonal range. Now, for a limited time, you can get even more when you add one of these impressive stomps to your arsenal. Until August 31, 2015, BOSS will send you a free Sanyo Pedal Juice with a qualifying purchase of an OD-1X or DS-1X. This cool rechargeable power supply runs your pedals for hours at a time, making it ideal for on-the-go performing and mobile pedalboard setups. The BOSS RV-6 takes pedal-based reverb to a new level of sound quality, versatility, and ease of use. Featuring powerful under-the-hood processing driven by cutting-edge BOSS tech, this impressive stomp makes it simple to get rich, inspiring reverb tones with any guitar setup. 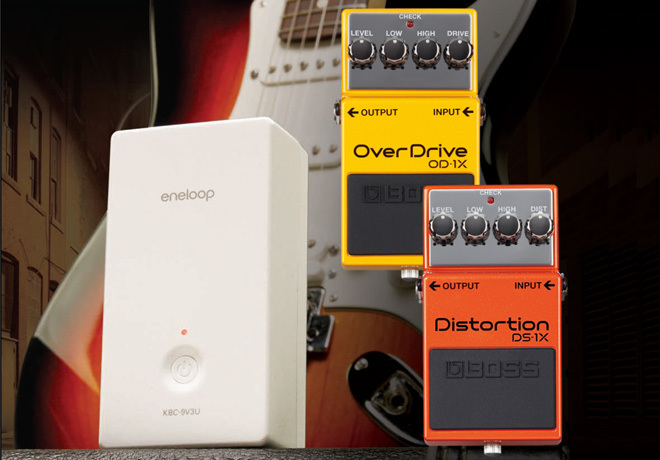 If you’ve been searching for the ultimate digital delay pedal, your wait is over. The new DD-500 is a powerhouse sound machine for creative musicians, offering 12 different delay modes with exceptional audio quality, plus deep editing controls, a graphic display, patch memories, MIDI, and much more. Capable of delivering an endless stream of unique, inspiring sounds, the DD-500 may be the last delay pedal you ever need.